The German Insurance Contract Law (Versicherungsvertragsgesetz—abbreviation VVG 2008) entered into force on 1 January 2008 after the major reform which aimed at providing stronger protection for policyholders, specifically with regard to the insurer’s obligation to provide information about the insurance coverage, policyholders’ pre-contractual duties of disclosure and violation of duties mandatory on policyholders. Insurance-based investment products are gaining popularity in Germany. These innovative life insurance products are usually complex in their structure and the German life insurance companies need to handle conflict between low interest rate and the customer’s aspiration of a certain security level. Moreover, additional requirements have been put in place in relation to transparency requirements which must correspond to the nature of these products. Bearing in mind that conclusion of unit-linked life insurance contracts in the form of an individual or collective insurance policy is a double-edged sword for potential customers, protection of consumers (policyholder and beneficiaries of a life insurance policy) is of special interest. All insurance contracts linked to investment funds (such as unit-linked insurance policy) in Germany from 23 February 2018 will be subject to the obligation to prepare a key information document pursuant to the PRIIPs Regulation and additional requirements for distribution prescribed in the Act implementing the Insurance Distribution Directive. 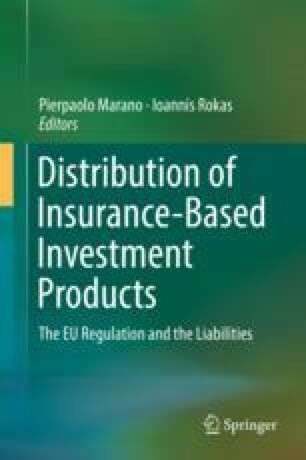 This paper deals with the question of liability of the insurers and insurance intermediaries in case of distribution of insurance-based investment products in Germany. This is followed by a short discussion of the historical development of unit linked business in Germany and legal framework for liability in German law.